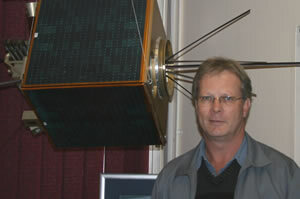 Herman Steyn graduated with a Bachelors, Masters and PhD in Electronic Engineering from the University of Stellenbosch. His thesis involved a multi-mode attitude determination and control system for small satellites. Herman also completed a MSc in Satellite Engineering in 1990 at the Surrey Space Centre. He was the prime designer of the ADCS system for SUNSAT, the first microsatellite with full three-axis control capability and a high resolution pushbroom imager. His research interest since 1990 has concentrated on attitude determination and control hardware and software subsystems for small satellites. He joined SSTL as Principal Engineer in 1998 as the team leader for spacecraft attitude and orbit control systems. At SSTL he was personally involved in six new satellite programs until 2001. Currently he is head of the Computer and Control Group in the Department Electronic Engineering. Apart from supervising Masters and PhD students, he is responsible for post graduate modules in Satellite and Space Engineering and Advanced Control Systems and leading a research program in advanced attitude and orbit control systems. He is a consultant for the AODCS group at SunSpace and leads the development and design of all commercial AODCS systems. Satellites already completed and qualified include an earth observation minisatellite and South Africa's second microsatellite, SumbandilaSat.